In coastal Maine, the ice is out on most of the smaller ponds. The bigger lakes have open water with large patches of ice. The wind and rain should take care of the remaining ice in the next few days! The beginning of my open water season has been very good. In the top left picture, Phil is holding a very nice brook trout he caught on a streamer fly. In the top right picture, I’m holding a 25” pike that hit hard in shallow water. We’ve also managed to get into a nice brown trout and a few warm water fish. Salmon fishing will start soon. After yesterday’s rain, the rivers are too high to fish. Once things settle down a bit, stream and brook fishing should be great. Fishing in April can be very cold. Dress appropriately and keep hand warmers with you in the boat. Becky with a salmon, trout and togue. Weather: Snow in the morning melting in the afternoon. April 1st first marked the official beginning of the open water fishing season. Other than streams, there isn’t any open water. In fact, the ice fishing season in Northern Maine has been extended until April 21. The ice fishing has been good this season. 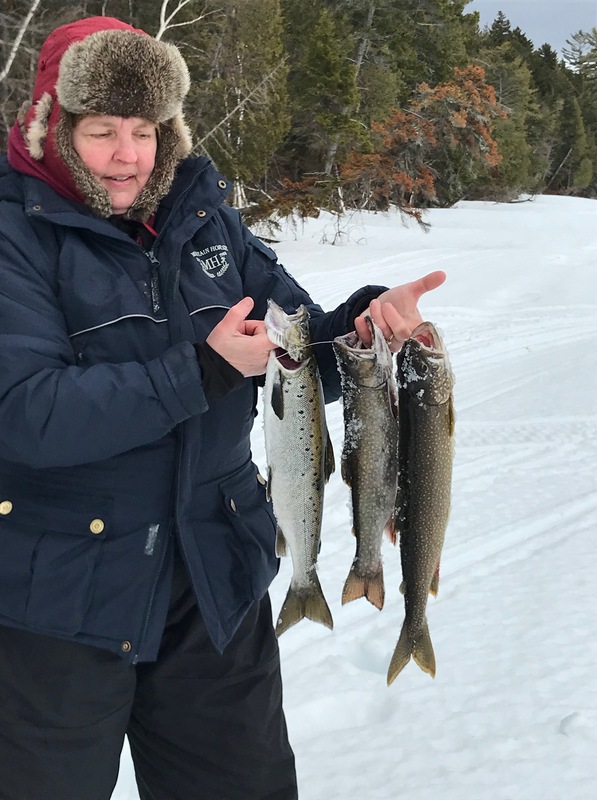 Plenty of fish were taken on Megunticook and Becky is holding three nice fish caught on Moosehead Lake. Fishing on coastal streams has been slow. The water is between 38 and 40 degrees. Once the high water returns to normal levels, the fishing should get good. When the water is cold, I like to fish streamers and leech patterns. Don’t bother with dry flies. Nymphs are effective, but you need to put them right on the fish’s nose. Even in cold water, a trout will chase down a well presented streamer. January was an excellent month for fishing. We still don’t have much snow on the ground, but the weather has been cold and there’s plenty of ice on the ponds. Between tiling the backsplash in my kitchen, cutting firewood, and teaching school, I have managed to get some fishing in. I got these nice brook trout on a local pond while jigging a silver spoon. It’s actually the same spoon I caught last month’s featured brown trout with. The fish were close to shore and just a few feet under the ice. I tend not to do a ton of jigging while ice fishing. I like to set my traps and let the bait do the work. There are, however, times when jig rods come in handy. If a fish trips your ice fishing flag and drops the bait, a jig rod can come in handy. If you have a spot with aggressive, schooling fish, a jig rod is often productive. Try jigging the next time you’re out ice fishing. Happy new year! Coastal Maine started off January with warm temperatures and no snow. The water levels on the St. George River are very fishable and there are some good fish to be had for those who are still fishing open water. Nero and I caught this little brown trout on spinning gear. He’d been feeding on case making caddis nymphs. The next warm day will be time to test out a new fly rod. The ice fishing is great this season. Reports of large numbers of trout and bass are coming in from students, friends, and coworkers. We had early ice, so most ponds in the area have 5 to 8+ inches of relatively clear ice. The abundance of rain this winter has also made conditions perfect for ice skating on ponds. Deer season was very successful. I tagged out on day three with a small buck and two other friends brought over animals to butcher at my house. Work on the old cape house I bought last year is progressing steadily. I haven’t spent as much time outside ice fishing and coyote hunting as I normally do, but I managed to install new countertops, paint the downstairs, and wire some new light fixtures. A tile backsplash and more painting is in store for the winter. I have a deck in the works for the spring in between fishing trips. When it’s warm out, I like to fish early in the morning and late in the evening. In the winter, I like to fish during the warmest part of the day. I think the fish are more likely to feed after the water has warmed up a bit. The only exception to this rule is ice fishing. When ice fishing, I like to fish early and late just as I would on open water in the summer. The water is cooling down and the fishing is still very good. On Saturday morning, we got into a bunch of nice bass with the biggest one four and a half ponds. It was a little rainy and cool, but the wind was down. Some of the fish are still in the shallows and other fish are moving into schools in open and deep water. On Sunday, Cathy and Louis from Colorado had an entirely different day. The sun was out and the wind was up. The fish were biting but we couldn’t get the big ones we saw the day before. In the fall, the fishing is very weather dependent. In the past two weeks, I have tried to spend some time working with my 5 month old labrador puppy. For his age, he’s been doing well on ducks and Grouse. Nero retrieved the 3 ducks and the grouse in the pictures above. As of today, my guiding season is over until April. The reports I write will include details from personal hunting and fishing adventures with friends and family. I had an awesome season and cannot wait until next year. I have already booked a few trips for next season, so it’s never too early to make a reservation. Fishing is about having fun. At the end of a very busy season, it’s important to remind myself that I guide because I love it. Catching a lot of fish or even a big fish is fun, but it’s not why I guide. I guide because of the interesting people I meet. Some of my favorite trips all year were not the most successful in terms of numbers of fish. My favorite trips were full of laughs, great conversations, and a few good fish every once in a while. Now is the time for smallmouth bass! The water is cooling off and bigger smallmouths are showing themselves more readily than in late summer. The leaves are changing and we’ve already had a couple of frosts in the morning. Heating and hunting season are just around the corner too. In the picture on the left Rachel is holding a nice smallmouth bass caught on a purple little kid’s rod she calls the “Purpetrator.” The rod was caught earlier this summer by a clients fishing on Megunticook Lake. The purple rod barely had enough backbone to land the fish, but Rachel did an awesome job getting it in the boat. Some of my favorite baits for fall are 3/8 oz football jigs and shallow diving crank baits. I’ve also been experimenting with the ned rig, but don’t know what I think yet. It’ll catch plenty of fish, but you often have to weed through a ton of small fish to get into a big one. The fishing has been excellent for large and smallmouth bass. In fact, the fishing has been so good for big fish that Ash decided to book another morning trip with me. We caught plenty of fish with several over three pounds and one over four pounds. We couldn’t break the 5 pound mark that day, but it was still an amazing morning. Plenty of fish are taking topwater baits, but the biggest bites are still in deep water. Fishing patiently with weightless soft plastics is working best. We’ve had a little rain, so the water in the rivers is starting to come up. The trout fishing is hit or miss. Some days it’s amazing and other days I’m lucky to get one or two. In the picture above Bob caught a nice little brook trout on a bamboo fly rod he built. Lately, I’ve been using hooks with fluorocarbon weed guards. I can easily keep the bait free of vegetation and appetizing to a big fish. I find that the hookup ratio is just as good with a weed guard as it is without one. Things are getting interesting on the water! The bigger fish are starting to show themselves. In the picture above, Ash is holding his biggest largemouth to date. The big fish of the day were caught in deep water between 10 and 15 feet. But topwater frogs were also getting the attention of some nice fish. Ash even had a Blue Heron try to take his artificial frog lure. September is one of the best months for big bass. We’re off to a good start. In spite of the heat, the trout fishing today was good. David caught several nice brookies and missed several more. For a novice caster, David did an awesome job of casting and fighting fish in tight cover. All but one of the fish came up to dry flies. Some rain and cool nights should really get the trout feeding heavily. Make sure you have enough gas in your boat before venturing out on the water. On Monday, Ash and I came across a large pleasure boat dead in the water. The owner ran out of gas and was trying to swim it to shore. We ended up towing the boat and its occupants back to the launch. The freighter canoe made a pretty nice tug boat. The light has changed and some of the maple trees are starting to get their fall colors. The fishing is good and getting better every day. It’s still hot but I know that autumn is on its way. Last week was a fun one. I had great trips with awesome clients. Megunticook Lake and the St. George River are fishing very well, but a few funny mishaps and strange sights really made my week. Blair and I saw a gray squirrel swimming out to an island on Megunticook lake. This was a new sight for me. In all of my years on the water I don’t ever remember seeing a gray squirrel swim. Susan set the hook on a fish so hard, the reel popped off the rod and went into the drink. Both the fish and reel were recovered. Jeff’s big largemouth escaped into the deep with the scale still attached before we even got a picture. Neither scale nor fish were recovered. Lori and Firefly just plain caught a ton of fish. Nothing strange happened, but it was a lot of fun. Fly fishing for trout has been a little slow, but the largemouth and smallmouth are hitting poppers hard. Bob and I had a great morning on the St. George. Foam and deer hair bugs did well enough that we didn’t need to throw a sinking line. It’s been a while since I’ve had a chance to sit down and write a good fishing report. The past two weeks of fishing have been excellent. I’ve seen a number of great fish between three and five pounds. Topwater and weightless soft plastics are producing well. The fishing in August can get very tough at times. Right now, the water is low and warm. The fish seem to be in two types of cover. Fish are chasing bait in very shallow weedy or rocky cover, or they are hanging out on deep water ledges and weed beds. Fly fishing for smallmouth is great in the St. George River right now. The fish like the one in the picture on the left are taking topwater poppers readily. A boat trip or hike into the lesser traveled stretches of the river can make for a very fun late summer trip. When fishing topwater poppers, it’s easy to get excited and pull the fly out of the fish’s mouth. When a fish takes your fly, count to two before setting the hook. The fishing has remained good in Midcoast. The best bit is definitely in the morning or late evening. We had some rain on Friday and Saturday that helped cool things off a bit. The cloud cover kept the fish feeding shallow and made it a little cooler for us in the boat. Soft plastics fished shallow are still producing plenty of fish. However, some of the bigger fish we caught yesterday were in deeper water. The boys from Thayer had an awesome two mornings in the boat with me. On Saturday they boated over 20 fish with the biggest one at 4 pounds. Another very large fish hit Edson’s lure right at the boat, but we couldn’t manage to land it. It’s a little too warm for trout fishing on the St. George river. I’ve been heading out after my morning trips with a fly rod and poppers. The low water makes the river easy to wade with shorts and sandals. There is plenty of room to cast and the action is fast. The fish aren’t huge–a good one right now is between 1.5 and 2 pounds–but the river is beautiful and the fishing is fun. Patience is the key to fishing deep water for bigger fish. You will definitely catch more fish when casting to lily pads, rocks, and logs along the shore, but the bigger fish like deep water. Cast unweighted worms in open water and work them very slowly along the bottom. If you put in the time, you will be rewarded with some nice fish. The heat and humidity has made things a little bit more difficult on Megunticook. Last Sunday, the water temperature in the afternoon reached almost 80 degrees. The best bite is definitely early in the morning and late in the afternoon. Great fish are still around, but it takes a little bit more time and a little bit more work. Miles, holding the largemouth bass on the top right, was patient and really put in his time. He was rewarded at the end of the day with a nice big 3 lb largemouth. Initially, he thought he was stuck on a rock. Miles did a great job fighting the fish and getting it to the boat. Sometimes, the state lake survey maps are misleading. “Cheese Curl Pond” doesn’t look good on paper. It seems pretty typical of a remote pond in Maine with a struggling trout fishery. But “Cheese Curl Pond” has some trophy bass! The best way to find great fishing is to explore! Remote trout fishing and camping trips are some of my favorite trips all season. Last week, I had the pleasure of taking Brad and John to one of my favorite trout ponds. The weather was perfect and the fishing was phenomenal. On our three mile hike to the campsite we stopped at a stream and got a few nice trout. We finished the hike, set up camp, and got right after the fish again. That evening Brad and John caught 50 or more trout on the first evening. Then, the next morning they caught 30 or more fish. It pays to work hard and get off the beaten path. Sometimes, a long hike and a little local knowledge can make for some amazing fishing! After we recovered from the heatwave in early July, the bass fishing got great again. Fishing early in the morning or late in the afternoon had the best results. By about 9 or 10 in the morning, the fishing slows. We still catch plenty of fish later in the day, but I work hard to put guests on great fishing and recommend we get on the water as early as possible this time of year. In the picture on the left, Gibert is holding a nice three pound bass. We had a wonderful day on the water with great conversation and fishing. In the picture on the right, Augie is holding a beautiful fish. Once he figured out how detect strikes and set the hook, he started to do some serious catching. The tip this week is to have fun fishing. My groups this week caught a lot of fish and I know it’s because they had great attitudes and had a lot of fun. Enjoy the experience and you’ll catch more fish! The weather has been unusually hot the past few days. Temperatures in the low 90s and high 80’s have changed fishing conditions significantly. Fish are moving from shallow rocky areas into deeper waters and shaded shallows. Focusing on docks and weedy areas can produce some bigger fish. Fishing jigs along deep drop offs is also a favorite tactic of mine. Topwater bugs are working for smallmouth and largemouth. I like to fish topwater in the morning or when the I see fish actively coming to the surface. Casting sinking lines and big streamers for bass is the way to go when the sun gets high. Detecting strikes when spin fishing is one of the most difficult things to teach people. I know that I have written this before, but keeping slack out of your line is extremely important. When fishing jigs and soft plastics, I rarely use my reel to retrieve the lure. Instead, I use the rod tip to pull my bait back to the boat. I use the reel only to take up the slack in my line. Give it a try and I promise you will hook more fish. It is officially summer! School is out, the weather is warm, and the fishing is awesome. The eagles are active in their nests and the loons on Megunticook have a pair of chicks. Lou Dagneau was able to get a few good pictures on our trip last week. The bass fishing is fantastic. The water hasn’t warmed up too much, so fish are still being caught in shallow areas. I’ve been seeing both large numbers of fish and heavy fish. In the picture above, Quentin is holding a nice 4 pound largemouth. He also landed plenty of other fish from 10 inches to 3 pounds and even a small pike. The rivers are a little low and warm, but trout can still be caught. Caddis and mayflies are out in big numbers. Alewives are making their way back out to sea. Soon, I’ll be back fishing spring holes with dry flies for brook trout. Fish haven’t seemed to move into shallow weedy areas yet. Focus your efforts around rocky structure with deep drop-offs. The fishing last week was some of the best I’ve seen all season. The weather is warm and the bass are off the spawning beds. The wind made things a little difficult, but the fish were cooperative. The bass are shallow and the rainbows are taking mayflies at the surface early in the morning and late in the evening. In the picture on the left, Cutter from Florida is holding a nice trout he got in shallow water. On the right, Trevor is holding one of the biggest bass I’ve seen this season. The Alewives are still in the rivers, but they have started heading back out to sea in some places. Caddis are hatching on streams and ponds. The stream fishing will be superb once the Alewives finish their run. A lot of people tend to overwork soft plastic baits. The biggest fish I saw this week were taken on baits that were allowed to sit on bottom for 15 to 20 seconds before being moved. Last week’s cool weather and rain has kept the water in the ponds and streams relatively cool. Mayflies and caddis are hatching in good numbers and the trout are taking dry flies. Flies tied on 10-14 sized hooks are working well. 30 or 40 fish days for bass are standard right now. We’ve been catching fish of every age and size. In past week, I’ve seen fish from 5″ or 6″ to 5 1/2 pounds. 1 and 2 pound fish are making up the majority of the catch. Fish are still shallow. A good pair of polarized sunglasses makes them easier to spot in the water. Good fishing can be had throughout the day, but the best conditions are in the morning and evening. To increase your chances of hooking a big one, consider booking two half day trips instead of a full day adventure. I’ve added a couple new rods to the arsenal this year. Bob White of White Woodcraft Maine has lent me a couple of fly rods he built. One is a sweet 7’6″ 4 wt. split cane bamboo rod that is perfect for the small trout streams of coastal Maine. The other is a really cool 6′ 3 wt. rod made out of Hop Hornbeam. Both rods are great fishing tools and an absolute pleasure to cast and fight fish with. In this week’s picture, a feisty brook trout is putting a nice bend in the bamboo rod. You’ll get a chance to cast both when you book a trout trip with me. The bass fishing is great. Large and smallmouths are on spawning beds in Midcoast. A stiff north wind on Saturday made it difficult to see the beds, but we managed to get plenty of fish. The bass aren’t super aggressive yet. I don’t think the spawn is in full swing, but it should be by the weekend. Bamboo is well suited to small streams. The rods load much more quickly than graphite, requiring far less effort to make accurate casts. The key to casting bamboo is to slow way down. When cast well, a bamboo rod will do most of the work for you. The fishing was amazing the past two weeks! Trout streams are at very fishable levels and the smallmouth are on spawning beds on certain ponds. In the picture above, Gabe and Faith are showing off a three person limit of brook trout. After just a couple of hours fishing, they had released close to 60 fish. It was a phenomenal morning that I will remember for a long time. The kids were fishing with worms and lures and the adults were fishing flies. Stoneflies and mayflies have been hatching consistently. I haven’t seen any caddis yet. The smallmouth fishing is hot right now! Some fish are on spawning beds. This is just the beginning of the spawn, so activity is pretty sporadic. In some ponds, the spawning hasn’t even started. In larger lakes, the fish are on beds only in certain areas. I haven’t caught a largemouth on a bed yet, so we should have about two weeks of bed fishing. I didn’t see any spawning beds on Megunticook last Saturday. Still, Josh and Allison from Manhattan managed to get some excellent fish. Allison got a nice largemouth and Josh landed a big smallmouth. Use a jig or Texas rigged soft plastic with a pegged sliding sinker to fish spawning beds. You need to make accurate casts to get fish on spawning beds. Jigs and pegged sinkers give you a lot of control over the bait. Trout streams are returning to fishable levels. Things are greening up well. Apple blossoms are starting and fiddleheading is excellent. The bass fishing is getting better by the day and I caught a couple of nice pike in the Belgrade Lakes. The weather is good and we are on track for a great spring. I’ve just been starting to see mayfly duns. The hatches aren’t very strong yet. Streamer fishing is still the name of the game when chasing trout. But the black flies are friendly and good mayfly and blue winged olive hatches are not far off. The bass have been hanging around shallow, rocky areas and submerged timber. Jigs and soft plastics are the best bet. Crank baits are also working. In the next two weeks, bass should start staging for the spawn. Unfortunately, it seems like the alewives have started their migration into freshwater early. This should make trout fishing hard for a little while. Don’t over look pike. The Northern Pike is an invasive species in Maine. This fish can do significant damage to native populations of trout, salmon, and perch. The state asks that anglers keep all pike caught in Maine waters. Pike is a good eating fish that deserves a spot on your table. The ice on all of the ponds in my area is officially out! Some ponds have been out for 2 weeks and others a week or a few days. We had close to 2 inches of rain last weekend. Most of the rivers and streams are too high to fish. The early bass bite is excellent. Big smallmouth and largemouth are hanging around shallow rock piles. The water is cold so fish are actively feeding in only a few warm spots. The best bite has been on jigs and crank baits. The smallmouth in the above picture took a jig dragged on a shallow sandy bottom. Some of the best fishing of the season will take place in the next two weeks. Weather has a big influence on the bass fishing in early spring. A warm front one day can mean nonstop action, and a cold front the next day can shut down the bite completely. During last Saturday’s warmup, we had 16 or 17 fish in just a few hours. Plenty of fish were in the three to five pound range. It was an amazing day. Yesterday afternoon was much colder and we had to work for a few three and four pound fish. Until the water temperatures rise, watch the weather to figure out when the best bite will be. The ice is officially out on Grassy and Chickawaukie Ponds in Rockport! Sections of Megunticook Lake are open and some of the smaller ponds are starting to open up. Water temperatures are in the mid 30’s. If we can get a day or two in the 50’s, the fish should start feeding. Unfortunately, the forecast is calling for a couple of inches of snow tomorrow. All of the streams are now open to fishing. The water is cold, but not exceptionally high. Fish can be caught, but you need to work for them. Streamers are productive early season choices. August and September trips are starting to fill up. I’ve already had multiple people request the same dates. Book now to reserve your spot for the busy summer season. Make sure you change out monofilament and fluorocarbon line before the start of the season. Ultraviolet rays make fishing line brittle. After loosing plenty of early season fish to brittle line, I’ve made it a ritual to re-spool all of my reels each spring. The sun is out and the air is warm. It feels like spring is just around the corner. I’m taking reservations for the upcoming season. Last year was booked solid, so make your reservations early to ensure you get the day and time you want. A lot of people are still out ice fishing, but I’ve already dusted off the open water gear. It’s legal to fish certain rivers in March. The results can be surprising. Right now, streamer flies are your best bet as hatches are sporadic and unpredictable. The early stonefly hatch should start to happen in the next few weeks. Some sun and warm weather will really get things going. The fishing should really pick up around the third week of April. Open water fishing in winter can be tough. The water is cold and the fish are sluggish. But winter fishing can also be a lot of fun. If you pick your days and find warm water, you can land nice fishing like the trout in the picture above. Remember to fish those sinking lines low and slow! The ice and fishing conditions are great. Most ponds have 12” or 18” of good ice. Plenty of nice fish are being caught in Midcoast. While I haven’t seen anything too impressive yet, some three pound brook trout, decent rainbows, and even an 8 lb. brown trout have been landed by locals. A recent trip to a small pond produced a couple of decent bass, like the one Verne is holding up in the above picture. The rain has made travel on the lakes difficult. The awesome snowpack we had this time last month is almost completely gone. There may be an inch or so of icy snow in the woods, but it’s not enough to travel the lakes on snowmobile. Hopefully, the snow will stick around after tomorrow’s storm. Last week, the fish were finicky. They were tripping flags and taking bait, but not getting hooked. When I’m losing a lot of fish, I will switch to a night crawler or change my hook size. Sometimes it makes a difference and my fish to flag ratio goes up. Weather: Cold, clear and windy. Happy New Year! Winter is upon us and I’m already dreaming about long, warm days on the water. The past two weeks have been downright frigid. Many are saying that this is the longest period of extreme cold experienced in generations. High temperatures have been averaging in the single digits with low temperatures 10 or more degrees below zero. By early next week we should be back to normal winter weather with daytime highs in the 20’s. We have a good snow base of 20 or more inches. Yesterday’s blizzard added another 10 inches to the base left by storms on Christmas Day and a couple in mid December. If you dress for the cold, the snowshoeing, skiing, and snowmobiling conditions are great. Even the turkeys in my yard have been enjoying the snow. People are reporting 8 or more inches of ice on the ponds, but always check before venturing out. Snow is a great insulator. I’ve already heard reports of vehicles going through the ice. This time of year is perfect for getting those projects done that I never seem to get to when the fishing is good. I’ve started on next winter’s firewood pile. The snowpack has made hauling wood by snowmobile relatively easy. I’ve also started building butcher block counter tops and bases for my new kitchen. Bob from White Woodcraft (https://whitewoodcraftmaine.com) has been kind enough to let me use his shop. He’s been a great help with design and woodworking tips. I’ve seen a lot of cars and trucks go off the road this winter. Please drive safely and slowly out there. Winter tires can also be a big help. They stay soft and grip well even when it’s very cold. This year, New England experienced the warmest October on record. After a dry summer, we finally saw some rain. In most places, water levels are returning to normal. A storm hit last week and knocked out power for over 500,000 Mainers. My power was out for four days, but I was lucky. There are some still without power in Lincoln County. Now, it’s cold and feels like fall again. We might even get some snow late this week! The weird weather hasn’t seemed to hurt the fishing any. Despite a stiff northwest wind and cool temperatures, Nathan from DC managed to land a three pound November largemouth. We landed several other fish that afternoon ranging from a half pound to over two pounds. I found it very surprising that we didn’t catch any smallmouth. We were probably fishing too shallow. Good fish can still be had in November, but check your laws because the official season has ended in Maine. Only certain bodies of water still allow fishing. The deer hunting this fall has been excellent. Several bucks over 200 pounds were tagged locally in the first week of rifle season. I tagged a doe opening morning, several students have shot nice bucks, and Duke bagged a nice little buck on his way back from the North Woods. State biologists estimate the success rate for deer hunters in Maine at somwhere between 11 and 14 percent. Until last week, this low rate of success had surprised me. After tagging out early, I started to pay more attention to other hunters. I noticed a lot of guys driving from spot to spot with their hunting clothing on. I even watched a guy walk down my road wearing orange, carrying a rifle, and smoking a cigarette. Deer have a better sense of smell than the average dog. Scent control is extremely important. A deer will smell you long before you see it. The guys who drive around wearing hunting clothing are picking up unnatural scents that are likely to scare deer. And the guy who smokes while hunting, probably won’t fill his tag this year. Wash your hunting clothes in scent-free soap and hang them outside for a few days. Seal the clothing in plastic bags until you get to your spot and are ready to dress. Make sure to use scent-eliminating spray immediately before heading into the field. Weather: Cool with light winds from the north and west. After almost a week of oppressively hot weather, fall is here. We’ve had light frost in the low spots and pastures for the past three days. My tomatoes and peppers aren’t looking very good. The cool temperatures are welcome. The trout fishing has continued to be excellent. We’ve switched from mayfly to caddis patterns. Sinking lines and streamers have also been producing. While no giant trout were landed–I blame the hot weather–we got into some very respectable red belly brookies. A large 20 plus inch was was spotted tailing in shallow water. He wouldn’t take a fly. Brook and stream fishing closed today. I’m sure we’ll see that fish again in the spring. Guiding season is winding down and the animals are moving. These three bears showed up at the trail camera a few minutes from my house. Now it’s time for the guide to do a bit of fishing and gear up for hunting season. I hope to close on a nice house and property in the woods by the end of the month. I’ll keep you updated on fishing, hunting, and life in the Maine woods. Fly tying is a great way to stay excited about fishing all year long. When the wind is blowing and the snow is piling up, tying flies can be a very practical and creative pastime. Just be careful, it can easily get out of control! Weather: Cool with moderate winds from the south. Fishing has continued to be great for both large and smallmouth bass. Many fish have now moved back into the shallows. In morning and evening, they can be found chasing baitfish in inches of water. But deep, rocky drop-offs are still producing big fish. Surface flies, craws, and soft plastics are all working well. Despite the low water, trout fishing is great. The changing light has helped the water cool very quickly. Still, most of the trout are concentrated in a couple of deep pools and nondescript spring holes. Right now, we’re catching wild trout from 10-14”. The big boys and girls will get more active as we get closer to October. Hope for a bit of rain. September fishing can be tricky. We can go from summer on a Monday to fall on a Tuesday. When the weather is good and the fish are biting, fish as often as you can. Today might be your last chance at the big one on topwater. Crisp mornings and relatively cool days have triggered fish into feeding heavily. Dropping water temperatures are telling fish to put on weight because fall and winter are just around the corner. Large and smallmouth bass are eating everything from smelt, to crawfish, to mice! With bass chasing large schools of smelts into the shallows, the streamer fishing has been excellent. I love to fly fish with streamers on full sinking lines, but most of my clients seem to prefer surface flies like poppers and sliders. Luckily the bass last week didn’t seem to mind coming up to the surface for big foam poppers. In the picture on the left, Stuart is holding up a beautiful bass he caught on a big Sneaky Pete. The fish hit Stuart’s fly and immediately headed for deep cover. The fish wrapped around some pilings and tried to break the line. Stuart did an awesome job keeping tension on the fish and we managed to get it in the boat. It was one of the best fish I saw taken on a surface fly this season! In the picture on the right, Willie Breeding is holding a very nice largemouth. Willie had one of the best afternoons I’ve seen this season. We watched huge schools of bass chasing smelts in ultra clear low water. We landed fish of all sizes and plenty of them. At one point, Willie landed 3 big fish on consecutive casts. Willie caught his personal best largemouth. I know we will get some more hot weather before fall sets in, but for now, the fishing is phenomenal. With a little rain, the trout fishing should get very good again. Most serious fishermen get to the point where the quality of the fish and the fishing experience becomes more important that numbers and size of fish. Last week, I was fortunate to fish with two fishermen who appreciate the pursuit of fish more than simply catching. I’m convinced this type of attitude makes people more successful on the water. Immerse yourself in the experience and adventure and you’ll have more fun and catch more fish. Weather: Warm with light winds from the north west. This morning felt like fall. It’s not getting light until close to 5:30 and temperatures in the low 40’s were a welcome surprise. The fishing has been very good. Topwater action for smallmouth has been excellent. This morning’s trip started off a bit slow, but once things warmed up and we found the fish, good things started to happen. The fish seemed to like the sneaky pete in yellow better than the popper in green. Stuart hooked a couple of big fish and had several big fish hits on topwater flies. Landing the big ones was a bit of an issue, but we’re headed out again on Wednesday to fix that. I love fishing with clients. It’s a ton of fun. But sometimes it’s important for the guide to do some fishing on his own. Last weekend I headed out on the Bunny Clark out of Oqunquit to do some bottom fishing. We had a great time with plenty of good Haddock, Pollock, and Cusk. In the picture above Steve and I are holding up a couple of Pollock. Even though I have the big one in this picture, Steve ended up landing a bigger 10 lb fish later that trip. We all ended up going home with plenty of fresh fillets for the freezer. The trout fishing is spotty. Experienced fly casters are doing well. On slow days, you will only see 5 or 6 good takes in a morning. If you have a handle on the fundamentals of fly fishing and fighting fish, you can have a good morning on wild trout. If you’re still learning, 5 or 6 missed opportunities can end up meaning no fish for the day. Ask plenty of questions and listen to the experts! Experience is the best teacher, but tips from a pro will help you a lot. If you see someone catching plenty of fish at the local river or pond, strike up a conversation and ask questions. By no means am I a skilled saltwater fisherman. I was impressed by some of the fishermen on the Bunny Clark. Duke, Merv, Brian, and Steve all out-fished me. I had a great day and it’s because I copied what they were doing. When it comes to fish, I’m never too proud to ask for tips. Weather: Warm with high winds from the north west. Shallow water fishing has been great. Fishing topwater frogs and soft plastics around lily pads are producing large numbers of fish. The biggest fish are being caught on craw fish imitations and topwater frogs. In the picture above, Caleb is holding a big bass caught on a craw fish imitation. In addition to plenty of nice smallmouth and largemouth bass, we caught a boat load of white perch this evening. We landed fish on almost every cast for well over an hour. After 48 perch it was getting dark and we had to head back to the dock. The fish were still biting. Sometimes, when you locate a school of perch, you can have nonstop action for hours. If you catch a white perch on bass gear, drop your anchor and switch to smaller tackle. You might have found a school of perch. Big schools of perch can produce literally hundreds of fish. Weather: Warm with high winds from the west. The last two weeks have been busy and hot. Because the water is low in most of the streams, bass fishing is the name of the game. Two patterns have been working well. Fishing with jigs and Texas rigs in open water and on rocky drop-offs has produced some nice fish. Ash, in the picture above, gave me permission to share his story. A foodie from DC, Ash wanted to try smallmouth bass. Smallmouth from deep cold lakes like Megunticook can be excellent table fare. After catching mostly largemouth and little smallies, Ash finally hooked into a big smallmouth. The fish came out of deep water and fought hard once it saw the boat. Ash made a good hook set and said: “This one’s coming home.” Being superstitious, I immediately shushed him. But the damage was done. Seconds after “calling his fish,” that big smallmouth shook the hook and got away. Apparently, fishing requires a great deal of humility. Weather: Cool with moderate winds from the north. What an awesome week of fishing! The weather was hot, but the fish didn’t care. If you can get up for the early bite, the big fish will show themselves. We saw numbers and size this week. David from Pennsylvania hooked one of the biggest smallmouth I’ve seen since spring. Benjamin and Daniel from Illinois caught 33 bass in 4 hours with a few fish in the 2.5 and 3 pound range. Bass are in the shallows, but the bigger fish are suspended on deep water drop offs. Texas rigs with sliding sinkers and jigs will catch the big ones. Slow sinking soft plastics will catch fish all day in all sizes. The trout fishing can be very good if you hit the weather right. Without a couple of cool nights and some rain, 40ft casts are a sine qua non for getting a decent brookie. Fly fishing can often be counterintuitive. When fishermen want more distance, they tend to “wind up” after the final false cast. Most new fishermen break their wrist and drop the rod tip well below their shoulder line. A good fly cast isn’t something you can muscle out with brute force. Timing, finesse and technique are necessary for a good cast. Keep your wrist straight and your rod tip high. Weather: Hot with light winds from the southwest. The summer season is in full swing. Coastal towns are busy, the weather is hot, and the fishing is awesome. Spin fishing with soft plastics has been the most consistent way to catch large numbers of bass. But with sinking lines and a little patience, clients have been landing some large fish on fly tackle. As the water warms, the fish start moving into deep water. Both bass and trout have been feeding in the shallows at first light before returning to deep water as the sun gets high in the sky. The water level in the trout streams is a little lower than I would like, but it hasn’t seemed to hurt the fishing any. Fish from 2 inches to 15 inches were taking dry flies yesterday. The morning rise was done by 7:00am, but there were plenty of fish in the fast pocket water to keep us busy. An alewife even took a dry fly in a small pocket. When planning a fishing trip, I tend to recommend morning trips. The weather in the morning is generally much more settled. The wind is often lighter, the temperatures are cooler, the risk of thunderstorms is lower, and the fish are hungry. Most fish do not have pupils that dilate. In the clear ponds and streams of coastal Maine, a bright sun will drive fish into the shade of deep water. In the morning, the angle of the sun allows fish to feed close to the surface where they are easier to catch. Weather: Warm with light west winds. The fishing has continued to be excellent. Despite the warm water in the ponds, fish are feeding heavily in the shallows. The alewives are finally gone and the bigger fish are not as well fed. Most inexperienced guests are getting into fish in the 3 pound range on each outing. The trout fishing can still be excellent. In the pictures above, Quinten poses with a few brook trout for the frying pan. He let the big one go–a wild fish taken on a fly rod. Some of the small streams in Western Maine can hold a surprising number of fish. We had a good couple of days. Fly fishing for smallmouth has been great on certain ponds. Even though we had an impressive green drake hatch this year, the bass aren’t taking topwater flies as readily as I’d like. Sinking lines are still producing the best fish. First time fly fishermen are still doing well. Early mornings with little wind make for the best times to learn casting. Smallmouth are great. Once hooked, they fight hard and make acrobatic jumps. Fighting one on a fly rod can be a challenge. When you hook a big fish, get him to the boat as soon as possible. The fish will try to head for rocks and fray your line. We learned the hard way this week that a big fish in the rocks will almost certainly break off. Weather: Warm with light winds from the west. The fishing was great this week! The past seven days have been full of fish and fun clients from all over the country. In the beginning of the week, I chased trout with experienced and first time fly fishers. Mid-week, I chased smallmouth with a first time fly fisher and an experienced fly fisherman. The end of the week was spent fishing with conventional gear. We managed to get a 5 year-old from Dallas his first few fish. Today, the Arkansas boys put up some big numbers! I lost count within the first hour of fishing. Bass are starting to be active on the surface. Shallow water and poppers are producing nice fish. Trout fishing is great, but you have to hit the early bite and make long casts. Big fish are around, but large schools of baitfish and alewives are keeping them well fed. It takes patience and some skill to get the big boys right now. Whether you are fly fishing or spin fishing, keep the tip of your fishing rod two or three inches above the water when retrieving a fly or bait. This technique eliminates slack line and allows you to better feel fish and set the hook. The past two days have been hot! In three days time, we went from weather in the 60’s and 70’s to temperatures in the 80’s and low 90’s. But the water is still relatively cool and the fishing is great. By the end of the week, the weather will have stabilized and we’ll be back in the 70’s. Bass are still spawning. The bed fishing can be excellent, but there are also plenty of cruising, feeding fish if you know where to find them. I’ve been focusing a lot on shallow water structure like trees, stumps, and visible rock piles. Jigs and soft plastics have been the most productive. In the picture above, Gabe holds a nice bass taken on a soft plastic. We never got to see the big one that broke his line. Losing a big fish happens to all serious anglers at one time or another. It’s tough on us all. I still have dreams about a very large fish that broke me off last year. Move on, keep fishing, and don’t let it get you down. If it helps, tell the story and exaggerate the size of the fish. Saturday was cold and windy, but Sunday was a perfect day on the water! The bass were on the spawning beds and the animals were active. We got close to three bald eagles and plenty of loons. We even saw a loon incubating an egg on a dock. In all of my years on the water, I have never seen a loon on a dock and have never seen a loon egg. Today was a day of firsts. Jeff and his daughter, Tess, were visiting from Alabama. Both managed to get into some nice fish. Jeff caught his first smallmouth and Tess landed her biggest largemouth. I wish we could have got our hands on the big smallmouth that broke Tess off when it jumped. When bass are on the beds, jigs and Texas rigged soft plastics work best. Cast beyond a bed and let your lure sink. Slowly work the bait back until it is on the spawning bed. If you spook the fish, let the bait sit. The fish will likely come back to the bait. If your line starts moving sideways, set the hook! The bass spawn will be happening very soon. I saw the first male of the season cruising around a bed on Sunday. I think we’ll start to see big smallmouth on beds by late this week or this weekend. Let’s hope the weather cooperates. The alewives are still in the streams. Once the bass spawn is over, I’ll be back on the streams chasing trout with a fly rod. The alewives should be gone by then. I had two very different trips this weekend. One was with an experienced salt water fisherman. The other was with two novices looking to get into the sport. May and June are great months for beginner or experienced anglers. You can have a day with multiple fish over 3 pounds like Mark from Georgia saw on Saturday, or you can have great action for beginners like Griffin and Ariel from Massachusetts saw on Sunday. When fishing for bass, it’s important to be aggressive with setting the hook. Bass have tough mouths. Once you feel the weight of a fish on your line, firmly pull or swing the rod in the opposite direction of the fish. If your drag is set correctly, a very firm hook set will not break your line. All the signs are pointing to summer. The bugs are out in full force, people are starting to vacation on the coast, and bookings are filling up fast. Soon, my seniors will graduate and then it’s just a few more days until school is done and I get to fish every day. The alewives have made it into the inland ponds. They can make the bass fishing a little difficult, but we managed to do well this week. After some hard fishing and a couple of missed bites, Melanie and Josh landed some nice smallmouth. In the picture above, Melanie holds up the big fish of the day. Quantabacook has also produced some nice bass. Now that the water is warming, fish are getting ready for the spawn. Some of the best sight fishing of the season should happen in the next one to three weeks. When you know the spawn is coming, make sure you get out as often as possible. If you miss a week of fishing, you might miss a chance at the biggest fish all season. The past two weeks have been full of rain, clouds, and high winds. The weather still feels very much like early spring. Right now, the fishing is hit or miss. I’ve had days with lots of big fish and days with no fish at all. It’s been an interesting spring. The big bass are definitely around. Normally, they are chasing down baitfish imitations in the spring. Slow moving crawfish imitations have been more productive this year. The crawfish approach worked on the big smallmouth the picture above. It has also taken some very nice largemouth. The alewives have started their annual spawning run into freshwater. They will make the stream fishing difficult for a couple of weeks. The alewife run is a great opportunity to see ospreys and eagles fishing. It’s important to flexible. If the fish aren’t biting at your favorite spot, don’t be afraid to try something new. Some spots that look “fishy” will never hold a fish, while other nondescript spots can end up being very productive. Remember, water temperature, cover, and feed determine whether or not a spot will hold fish. After a few days of sun, the fishing is off to a great start. The salmon and trout are feeding close to the surface. Even the smallmouth are starting to bite. The streams are down to reasonable levels after the spring runoff. There is rain and wind in the forecast for the rest of the week, but the weekend will bring ideal fishing conditions. Spring has sprung and some of the best fishing of the season is right around the corner. This will be a great year for early season trips. When the water is cold, shallow, rocky areas warm up more quickly than the rest of the lake. The rocks retain heat from the sun and attract aquatic bugs and baitfish. Locate these areas and the gamefish will be close by. Despite temperatures in the high 70’s on Sunday, spring has been slow to arrive in Maine. The ice finally left the ponds in my area last week. I just got a report from a friend that there is 30” of ice at Churchill Dam! It was a cold, gray day out on the water. But the weather didn’t stop the fish from biting. I was able to find a few trout willing to take a fly in shallow water. The little guy in the picture took a size 8 extra long streamer–a very big meal for a little fish. The salmon were also out moving around. Like the 16” fish in the picture, most of the salmon were feeding heavily on tan mayfly nymphs. I’m hoping they start chasing smelts soon. The loons, eagles, and osprey are moving back to the ponds. The loons were doing well fishing today. They caught the attention of an osprey who didn’t tolerate intruders. The osprey dive bombed the loons for close to twenty minutes before the loons finally moved on. One of the most challenging parts of being a guide is helping guests plan trips around “prime fishing times.” Last year, the ice was out in early March. This year, it went out more than a month later. Instead of calendars, I try to use water temperatures. The best spring smallmouth bite may usually be the first or second week of May, but it’s always when the water reaches temperatures in the low to mid 50’s. Keep a log of water temperatures and fishing conditions. In a few years you’ll be able to pattern the fish and better predict the best times to be on the water. Weather: Cold, Snowy, and Icy. Water Temperature: Ponds are still frozen, but most streams are open in the quick runs. Last year at this time, I was already casting flies to trout on local ponds. Those same ponds still have close to two feet of ice in some places. Most of the streams are open, but still have significant ice in the slack water. Even the annual St. George River Canoe Race, held the last Saturday of March, was cancelled due to ice. This year’s weather is much more typical of winter in coastal Maine. Rain and warmer temperatures are forecasted for this week. By the official opening of spring fishing on Saturday, the rivers should be completely open and ready for a fly. The ponds will take a bit longer to open up. By the third week of April, the streams and ponds should be producing well. We had a decent snowpack in February and March. The snowmobiling was good. On a warm day over school vacation we headed out to a favorite spot to get a jump on cutting firewood. With good snow, we were able to get at some nice oak trees that I can’t reach with my truck in the summer. The rain this week should get rid of most of our snow. I always get excited about the opening day of spring fishing. I fight the urge to be on the stream at first light. In early spring, wait until the water warms up before heading out to fish. The afternoon is often much more productive than the morning. This year has been unusually warm and dry. Only recently have we started to get some wet weather. At the end of November, we should be getting snow instead of rain. This year, I spent a lot of time in the woods chasing deer. This year’s buck was 185 pounds and eight points. He was shot on the run in hot pursuit of a doe while “still hunting” at 40 yards. The water is open and some big trout can still be caught before freeze up. Unless you have spent years hunting the same spots, I suggest getting out of the stand and walking around. If you’re good about scent control, work the wind, and move slowly through the woods,spending midday still hunting and looking for sign can be very effective. A lot of people will tell you to sit in one spot, but walking has always worked for me. Weather: Cooler, sunny and dry. It’s definitely fall. Right on schedule, we got a cold snap with a few days of the autumnal equinox. We’ve had high temperatures in the 60’s and low’s in the 30’s. It’s time to clean my chimney and get the wood stove ready for winter. Fish are starting to change their habits. Trout are taking flies in places I haven’t seem them since spring. The bass are still hitting on the surface, but seem to be more interested in subsurface presentations. This time of year, you have to pick your days. The fishing can be phenomenal or it can be a little slow. It’s important to fish more slowly as the water cools. It’s easy to use the same baits and retrieves that worked three weeks ago when the water was warmer. If you use a thermometer, you can monitor the water temperature and adjust your techniques accordingly. I have been testing out the Goose River Guide Canoe in the above picture. This canoe was built by Bob White of Rockport, Maine. Bob built this canoe on an E.M. White model 3 form. He made a few improvements. Of these improvements, my favorite is the modified stem profile. It’s not as tall, so it doesn’t catch the wind like some of the original versions. This is a fast canoe with a lot of secondary stability. Thanks to Bob for loaning this canoe to me for the fall. Check out his work at https://whitewoodcraftmaine.com/. It took an experienced guide to teach me that water temperature is tied more to the angle of the sun and length of the day than the air temperature. The fewer hours the sun hits the water the more quickly the water cools. We’ve had unusually warm and dry weather, but my favorite trout stream is much cooler than one would think. The nights have cooled, the days have shortened and the bigger trout have come out. Fly fishing for trout has been very good, but very technical. The trout are congregated in a few deep spots. Conditions like these are why you hire a guide. You could fish all day and catch nothing or catch 15 trout in 30 minutes. If you are out for the better than average fish, make sure your casting is sharp. I cannot stress enough how important casting practice is to successful fishing. If you have a trip planned, start casting 2 or 3 times a week for at least 3 weeks. Even if you have to use the back yard, it’s important to build that muscle memory. It’s like homework for fishermen, but much more fun than translating Latin. I take that back. It’s just as fun as translating Latin. Weather: Cooler and cloudy with high humidity. The light has changed and the water is starting to cool. The fly fishing for smallmouth has been excellent. On certain ponds, the fish have been chasing bait to the surface. Sometimes, it can be hard to follow these fish. You need to be quick with a cast. Consistently reaching out to 40 plus feet will score you some more fish. This style of fishing is great practice for those who want to chase big saltwater species. The more time I spend on the water with clients, the more I notice that popper fishing can sometimes be a struggle. It’s easy to get excited when a big fish hits on the surface. This tip applies to dry fly and popper fishermen: keep your rod tip close to the water, minimize slack, and give the fish a few seconds before you set the hook. I had the pleasure of guiding an excellent fly caster the other day. He could pitch a popper super close to cover with great accuracy. We didn’t even lose a fly. He’d fished everywhere on my bucket list: Montana, Labrador, New Zealand, etc. I loved his Sage Smallmouth rod–it threw a popper in 7 wt. like an 8 wt. or 9 wt. We had lots of nice surface hits. We landed lots of fish and missed lots of fish. One strike stands out in my mind. There was a bit of chop on the water. He gave the popper a nice strip. It was hard to tell the difference between the surface disturbance from the popper and the splash from the fish. The fly disappeared and didn’t come back up. The client didn’t think he had a fish, but a nice smallmouth was hooked up. Give the fish more time than you think they need with a surface fly. On lightly pressured lakes and ponds in Maine, you don’t need to set the hook as soon as you see the strike. Sometimes, I wait until I feel the weight of the fish to set the hook. When smallmouth hit a popper, they mean to do it harm. The foam poppers and sliders I tie seem to be more effective than plastic or balsa poppers. The fish hold a soft fly longer. Slack line is a fly fisherman’s worst enemy. Slack line will ruin your casts and lose your fish. Keep your rod tip close to the water. Your hookup ratio will increase and your casting will improve. Weather: Warm and dry with West winds. I know it won’t last, but I’m starting to feel autumn in the air. The nights have been cooler and the light has started to change. We finally got some real rain yesterday morning. My two clients yesterday were troopers. They fished through high winds and serious rain. The rain was so heavy, we had to pull the boat on shore and pull the drain plug to get the rainwater out of the boat. The weather eventually passed and we got into lots of smallmouth. I’ve been experimenting with a lot of topwater bass flies recently. I’ve found that fish often prefer a less intrusive fly like the yellow sneaky pete in the picture above. These flies work best when fished very slowly and deliberately. This slow style of retrieve can be very difficult for a lot of fishermen, but will pay off for the patient angler. My thoughts about less intrusive surface flies were confirmed yesterday by a client. This client was spin fishing while his buddy was fly fishing. The client asked if he could tie on a Jitter Bug lure. The soft plastics were working, but he wanted to fish topwater. The Jitter Bug is a classic bass lure that was first introduced in 1938. It is still being made today. I pulled one out of my box–I hadn’t used it in many years–and tied it on. The fly caster and I sort of laughed at the thought of fishing a Jitter Bug. Pretty soon, that Jitter Bug was catching lots of nice smallmouth. The client fished the Jitter Bug the same way I fish the sneaky pete. He would cast, let it sit, give it a twitch, then start a slow retrieve. He would pause the lure during the retrieve, let it sit, give it a twitch, and continue the retrieve. 90% off the fish hit on the pause or just after a the twitch. Don’t be afraid to try something new. As a guide it can be easy to fall into a routine of fishing the same spots with the same lures. It’s important to keep learning and trying new things. If you hire a guide, listen to your guide, but don’t be afraid to make suggestions and experiment a little. Your guide should be just as eager to learn and improve as you. The bass fishing on Megunticook Lake has been very good. The smallmouth have been a little harder to find than the largemouth. Shallow water fishing for bass has been producing lots of small to medium sized fish. Fishing slowly on deep water structure has been producing some of the biggest fish of the season. In the picture above, Jeff is holding a very nice largemouth. On clear water lakes, use shade to your advantage. Fish are more willing to take a lure in shallow water if the shore is shaded. Fish early in the morning or late in the evening for the best results. Weather: Hot with variable winds. August is one of my favorite times to fly fish for bass. In the mornings and the evenings, bass are often very willing to come up and take a surface popper. August is an excellent time to introduce new fly fishers to the sport. The weather is warm, lots of fish are in shallow water, and the wind is much more manageable than it is in the spring. The top left picture shows Ted with his first fish on a fly rod. He learned to cast just minutes before. When introducing someone to fly fishing, it’s very important that they be successful early on. A couple of fish on the first day really increases the learning curve. For bigger bass during the late morning and middle of the day, deep water is the ticket. Patience and boat management become very important when fishing deep water. Trout can still be caught. Deep water trolling and fly casting to springs are the best ways catch them. Some serious rain would really improve the trout fishing. When fishing poppers for bass, long pauses between pops are important. Wait longer than is comfortable. It’s okay to be aggressive with your flies, but be sure not to pop a fly right in the fish’s face. If you see a fishing moving toward your fly, don’t move the fly unless the fish loses interest. Weather: Hot and humid with variable winds. Water Temperature: Low to mid 70’s. It’s been super hot and humid. Bass fishing is still great, but we’ve been having to move to deeper water in the larger lakes. Heavily weighted lures and deep diving baits are going to be increasingly productive. The best fishing has been early in the morning or late in the evening. Despite the hot and humid weather, the rivers and lakes are low. Things are still dry from our two year mini-drought. This dry, warm weather has forced trout into predictable spring holes. The fishing takes a little finesse, but it can be very good if you know where to go and what to use. When the weather gets hot, deep diving crank baits can be very productive. Crank baits are about structure contact. You want your bait to strike bottom and structure. If you are fishing in 15′ of water, you may want to use a crank bait that dives 20′ t0 25′. Weather: Rainy with light Northeast winds. Fishing for largemouth bass has been very good. The water is warm and the fish are in shallow water. A lot of fish have been hanging around weed beds and rock structure. Soft plastic lures have been working well, but the crank baits are still working for those deeper fish. The trout fishing is still good on the streams. You might be surprised at the number of nondescript little streams in Coastal and Central Maine that hold trout in the summer. You never know until you stop and fish. Chanterelle mushrooms have started to come up. After close to two days of rain and clouds, more should be coming out soon. When stream fishing in summer, I always keep my eyes open for Chanterelles. Keep a little 6’6” fly rod in your vehicle. If you see a nice pool from the road, stop and give a few casts. Sometimes, those pools can produce some surprising fish. I found an excellent pool this way while hiking last year in Western Maine. Sometimes, it really pays to keep an extra fishing rod in your car. Weather: Clear with South winds at 10 mph. I’ve been complaining for a while about the lack of rain. We finally got some. We had heavy rains on Wednesday and Friday. The storms were isolated with the immediate coast getting most of the rain. When the storms rolled in on Wednesday morning, the rain was so heavy I had to bail out my boat. Water filled the boat above the drain plug. But the change in barometric pressure got the fish feeding aggressively. The storms soon passed and we were catching nice bass on successive casts. Sometimes, it pays off to stick it out through foul weather. Friday’s storms came late Friday night and early Saturday morning. The rains were so heavy that the river rose close to two feet. I had hoped that the rain would turn on the trout just like it had the bass on Megunticook Lake. Unfortunately for us, the cloudy water made conditions tough. While we did see some nice trout, the fishing wasn’t exactly what I had hoped for. In the above picture, Josh is casting for trout in what looks like bass water. The water should settle soon and things will go back to normal. When fishing a flooded stream, dry flies won’t always work. If the rivers have really been churned up, I think a lot of trout are feeding on baitfish and dislodged nymphs. Don’t be afraid to use a sinking line with a streamer or nymph. Weather: Clear and dry with South winds at 10-15. The smallmouth bass fishing in the Belgrades has been excellent. We have been doing well fishing rocky structure in shallow water. The smallmouth and largemouth fishing on Megunticook Lake in Camden has been excellent. Megunticook is a large lake and can be difficult to learn. It’s often a matter of putting in a lot of time on the water, or hiring a knowledgeable guide. The trout fishing is still excellent. The water is very low, but the coast got some serious rain today. I’m hoping it was enough rain to bring up the rivers some. Use the wind to your advantage. When fishing a new body of water without a trolling motor, let the wind push you around. Drifting lets you cover lots of water and helps you target productive water. When you start hooking fish, drop and anchor and fishing the area more slowly. When the bite stops, pull up your anchor and continue drifting. Weather: Clear and hot with South winds at 10-15. The bass fishing in the Belgrade Lakes region is excellent. The lakes are large and picturesque with a variety of species to catch. Large and smallmouth bass, pike, trout and salmon can all be caught in this chain of lakes. Here is a picture of one of today’s many smallmouth. The coastal trout fishing is great again. The alewives are gone and there have been evening hatches of caddis. We still need rain, but the water has remained relatively cool. If we get some wet weather, the first Chanterelles of the season should be out soon. When docking in big water in the wind, don’t forget your bumpers like I did today. In a pinch, lifejackets thrown over the gunnels will work. Weather: Cloudy with winds 10-20 from the West. The weather this week has been unusually cool and cloudy. Temperatures have been in the 60’s and 70’s with wind and clouds. We got a couple of good rain storms, but the water is still low. We are trying to play catchup from last summer’s drought and last winter’s poor snow pack. But the weather hasn’t negatively affected the fishing. Above are a couple of guests who got into some nice smallmouth bass. These southern boys also got their first taste of schooling white perch. We boated something like 32 or 33 fish in four hours. It was a great morning! White perch cruise in big schools. If you are bass fishing and happen to pick up a white perch on a crank bait or the like, anchor and fish the area with a small lure. If you find a good school, you can catch fish on every cast. White perch are excellent table fare and there is no limit to the number you can take home. Weather: Cloudy with calm or no wind. Last weekend, I had the pleasure of guiding a young man on a backcountry fly fishing trip in northern Maine. The bugs were bad, but the fishing was excellent! Although Adam was new to fly fishing, he managed to catch some very nice trout–and a lot of them. By the end of the trip, he was casting like a professional. We fished ponds and small streams. Dry flies, nymphs, streamers, they all seemed to work. Hike-in trips to remote trout ponds are some of my favorites. The fish are often very willing to take a fly and the scenery is unmatched. Use monofilament leaders for floating lines and dry flies and fluorocarbon leaders for sinking lines with streamers and nymphs. Monofilament floats and will help to keep your fly on the surface of the water. Fluorocarbon sinks and will help get your fly down to productive depths much more quickly. Weather: Rainy in the morning and sunny in the afternoon. Winds 5 to 10 from the South. The smallmouth spawn is well underway. The picture above is of a large spawning bed. Only a few largemouth have been on beds, and they haven’t been as aggressive as the smallmouth. The fish have been taking just about everything we throw at them. Large schools of white perch have been cruising the shallows. Keep a silver crank bait close by. Sometimes there are big fish following the perch. Large numbers of alewives have moved into the rivers. Trout fishing on streams is tough, but there are still plenty of trout around in the ponds. When bass spawn, the male guards the bed. Males are usually much smaller than the females. Be patient and bring your polarized sunglasses. You will see the female patrolling the area around the spawning bed. Sometimes, if you put in the time, you can get these big girls to bite. Weather: Warm and sunny with calm winds. The weather here in Maine has been beautiful. We haven’t had a frost in about two weeks and the water temperature is creeping up into the low 60’s. Now, we just need some rain. Some of the summer people have even started making their way to the area. In the picture above, a pilot takes off from Washington Pond. Bass are moving into the shallows. Some are already on spawning beds. Trout are taking dry flies and the caddis are out. Things are going well, but the alewives will show up soon and make things difficult on certain bodies of water. When the alewives are running, it’s best to fish landlocked bodies of water. I try to stay away from coastal rivers and ponds connected to the ocean by streams. Don’t think central Maine is safe either. The fish show up in ponds 30 or more miles from the coast. The fly fishing for smallmouth bass has continued to be excellent. Throwing big streamers on sinking lines is one of my favorite ways to fish. Bill landed this 3 pound fish on a local pond. The fish made a couple of nice, line peeling runs. Bill kept the fish up above the rocks and it cleared the water several times with some acrobatic, head-shaking jumps. Trout fishing has remained very good. Last week was cool and rainy, but when the sun did come out, bugs started hatching. Small dark mayflies have been the bug of choice, but the caddis will be here soon. Fluorocarbon is your friend. In the spring, when the water is clear, fluorocarbon leaders and lines are the way to go. Fluorocarbon has the same light index as water and is virtually invisible to fish. It’s more expensive than monofilament, but it’s worth spending the extra money for good fluorocarbon. Weather: Cloudy with calm winds from the south. Midcoast Maine has some superb smallmouth bass fishing. Once the water warms up a bit, the smallmouth start storing calories for the upcoming spawn. The above picture is of one of the four pound smallmouth caught today. This girl took a size 10 streamer fly that was catching trout just last week. Most people think of trout and salmon in April and May, but I always have my best smallmouth fishing in late April through late May and early June. The trout fishing has remained quite good with hatches of BWO’s on the rivers and larger mayflies on the lakes. The trout are definitely starting to look up. Largemouth fishing can be frustrating this time of year. You will see big fish cruising in shallow water. Sometimes you will see schools of fish cruising. They just don’t want to eat what lure and fly fishermen have. Be patient, they’ll be feeding soon. Fish on the rocks. In spring, I find that fish are especially attracted to submerged rock piles. Much like the bricks in your wood stove or fireplace, rock piles in your favorite pond retain and radiate heat. They also attract bait fish and provide great cover for feeding bass. Weather: Rainy in the morning and clear in the afternoon. The trout fishing has been phenomenal. The water is cold and the trout haven’t spread out yet. It can be tough to find them, but when you do, you’re in for some fun. In the picture above, Dan is holding a healthy brook trout. A number of nice fish came from that pool. We released a big female before we could get a picture. To complement the great trout fishing, the black flies have been out in swarms. I also saw my first tick of the season. This time of year, it’s especially important to check for ticks. Bug spray with deet will help repel ticks. Spray around your boots and pant legs. If you don’t like deet, rose geranium oil is an organic alternative that seems to work. Weather: Warm with light winds from the north. The smallmouth bass are starting to move around. The water is still cold, but the fish seem to be collecting around deep, rocky structure and drop-offs. Most fish were a pound or less, but I did see one three pounder. It’ll just keep getting better as the weather warms up. The picture above is of local canoe builder, Bob White–whitewoodcraftmaine.com. I had a half day at school before April vacation, so we snuck for a few hours on the river. Most people like dry flies, but when the water is cold, trout love a big streamer. When the water is cold, fishing the shallows for bass is often unproductive. I saw two guys fishing shallow water this morning. We talked at the boat launch in the afternoon. They didn’t see a single fish. Find a steep drop-off and fish deeper than you think you should. Weather: Clear, cold and windy all day. The weather wasn’t great for fishing last weekend. The wind blew all day on Saturday and Sunday and temperatures only made it into the 40’s. But that doesn’t mean the fish weren’t hungry. This brook trout nailed a streamer and coughed up a 7″ salamander. The weather service is calling for temperatures in the 50’s and 60’s this weekend. Warm weather and April vacation is just around the corner. I hope the smallmouth cooperate. Floating fly lines are great, but don’t forget to fish sinking lines. My favorite is a clear intermediate sinking line. It’s great for throwing streamers. Most brook trout over 11 or 12 inches feed on larger prey like fish. Read Forrest Bonney’s book, Square Tails. Weather: Cloudy in the morning with light and variable winds. Rain in the afternoon. Today was one of those beautiful spring days I dream about all winter. During the summer, it can be difficult to find parking at the boat launch. This morning, I only saw one other boat on the 1,300 acre Megunticook Lake. The new lake warden was out addling goose eggs. I was happy to see four or five pairs of loons, lots of ducks and geese, and a large, mature eagle. The bass haven’t been moving much, but I did get into a few short trout. Megunticook really gets good when water temperatures creep up into the 50’s, or, as the old-timers say, when the swallows come out. Early spring fishing is often about finding warm water and active fish, but choosing the right body of water is also important. I have never understood why some lakes have great fishing after the ice goes out and others fish poorly. Two of my favorite ponds come to mind. They are very similar in depth, water clarity, bottom contour, and are only a few miles apart. One has phenomenal early fishing, the other has slow fishing until May. To find great early fishing, put in lots of time on the water or hope someone takes pity on you and shares some information about their favorite pond. Weather: Cloudy in the morning with a few flakes of snow and sunny in the afternoon. Calm winds from the south. Spring trout fishing has started to pick up. The rivers are still a bit too high, but pond fishing has been good. After last week’s snow storm, I’m hoping the weather starts to settle a bit. In the afternoons, when the sun warms up the shallow water, brook trout and brown trout have been cruising for nymphs. You probably won’t see much surface action yet, but if you’re patient with a nymph, you can get into some nice fish. This brook trout took a small red and white streamer. Finding warm water can mean finding actively feeding fish. You might bring a stream thermometer with you. Attach it to a string and take bottom temperatures. When you catch a fish, record or remember that temperature. If you can identify any patterns, keep looking for similar temperatures elsewhere. Pretty soon, you’ll have consistent catch rates in “less than ideal” conditions. It’s only March, but the ice is already out on the rivers and larger lakes. While today is a bit chilly, we are going to get weather in the 50’s and 60’s next week! Great ice out fishing is just around the corner. Today, I got the boat into Bob White’s shop for a good cleaning and to touch up some varnish and paint. Bob makes some beautiful canoes and paddles in this shop. Check it out: https://whitewoodcraftmaine.com. All I have to do now is change the oil in the motor and the boat will be ready for fishing on Saturday.